Foxes are generally smaller than other members of the family Canidae such as wolves, jackals, and domestic dogs. 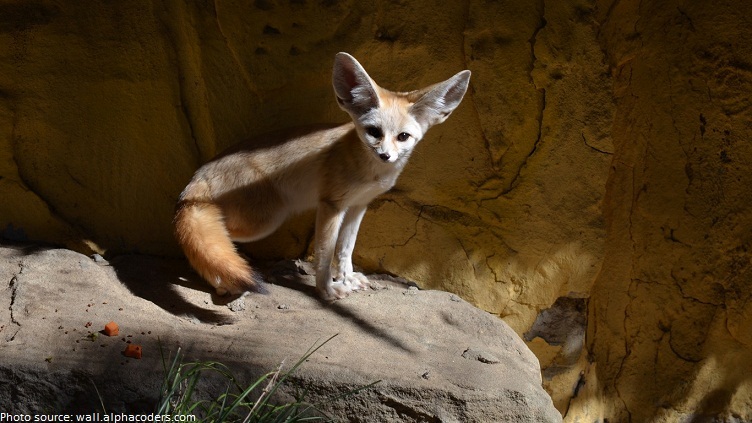 For example, in the largest species, the red fox, males weigh on average between 4.1 and 8.7 kg (9.0 and 19.2 lb), while the smallest species, the fennec fox, weighs just 0.7 to 1.6 kg (1.5 to 3.5 lb). There are around 12 different species of fox found around the world, which include the urban fox or red fox, the beautifully white Arctic fox, the sand fox which is a light-coloured fox found in desert regions and the tiny yet big eared fennec fox. Wild foxes tend live for around 3-6 years, but some foxes have been known to be older than 13 in captivity. Foxes are found on every continent except Antarctica. 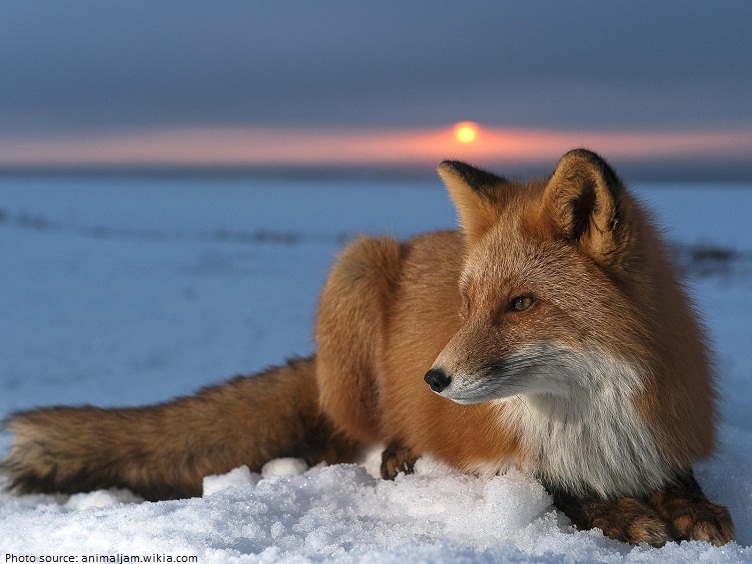 Foxes usually live in forested areas, but they can be found in mountains, grasslands and deserts. 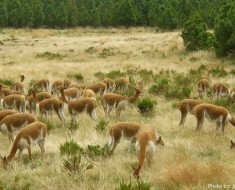 They also thrive in cities, towns, and rural settings. Fox are also fairly transient animals and frequently move from place to place. Foxes are omnivores animals and this means that they eat meat and vegetation.They eat small mammals, birds, reptiles, frogs, eggs, insects, worms, fish, crabs, mollusks, fruits, berries, vegetables, seeds, fungi and carrion. 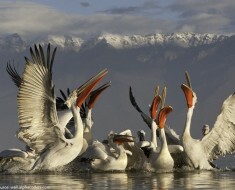 In winter they mainly eat mammals, such as mice, rabbits and other small animals. Foxes are primarily nocturnal animals that means they like to hunt at night .This means that they sleep during the day. This can change, though, depending on where the fox live. Foxes are great night-time predators because their eyes are specially adapted to night vision. 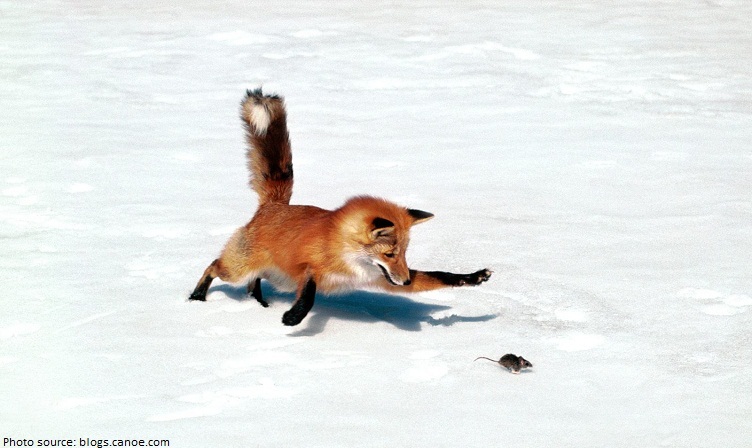 Foxes are also very fast. 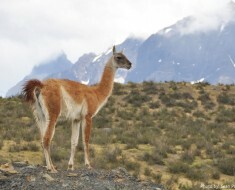 They can run up to 65 kph (40 mph). A fox’s den is normally a burrow underground, also known as an ‘earth’, but they can also live above ground in a cousy hollow. That provide a cool area to sleep, a good location to store food and a safe place to have their pups. Burrows are dug-out tunnels that have rooms for the fox and its family to live in. The burrows also have several exits so that they can flee if a predator enters the burrow. 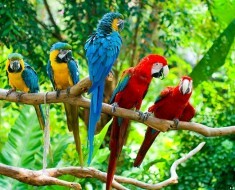 The breeding season is from January through March. 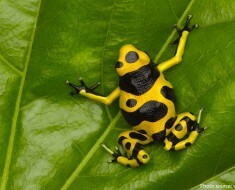 After a gestation period of 51 to 53 days, females give birth to a litter that usually have 2 to 7 pups. She will make nest of leaves inside her burrow for her pups. This special room in the burrow is called a nesting chamber. Both the mother and father share the care of pups. 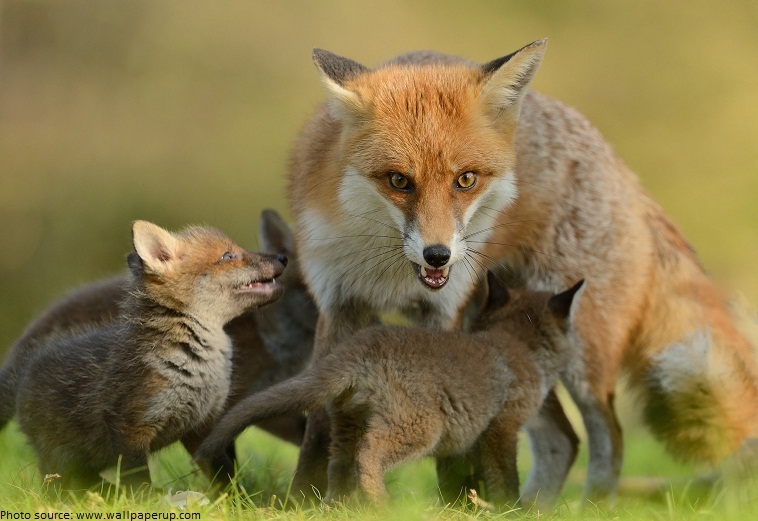 When raising their young, they live in small families—called a “leash of foxes” or a “skulk of foxes”—in underground burrows. Otherwise, they hunt and sleep alone. Male foxes are known as dogs, tods or reynards, and females are called vixens. The red fox has the widest geographical range of any animal in the order Carnivora.It’s range is the entire Northern Hemisphere, from the Arctic Circle to North Africa to Central America to the Asiatic steppes. It’s also in Australia, where it’s considered an invasive species. 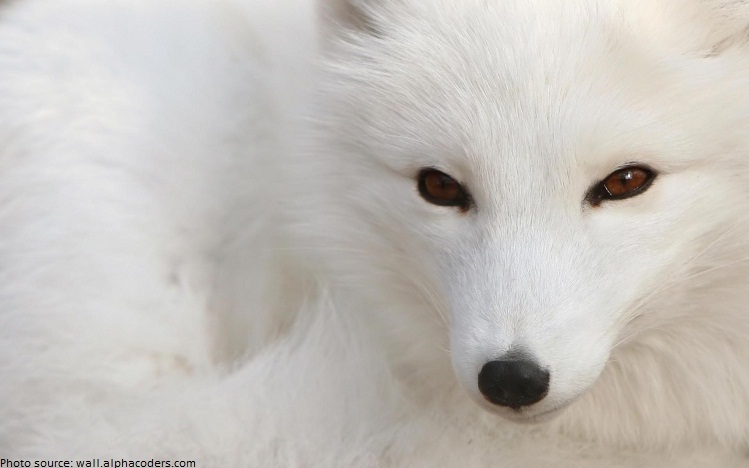 Arctic foxes and fennec foxes are listed on the International Union for Conservation of Nature and Natural Resources list of threatened species. 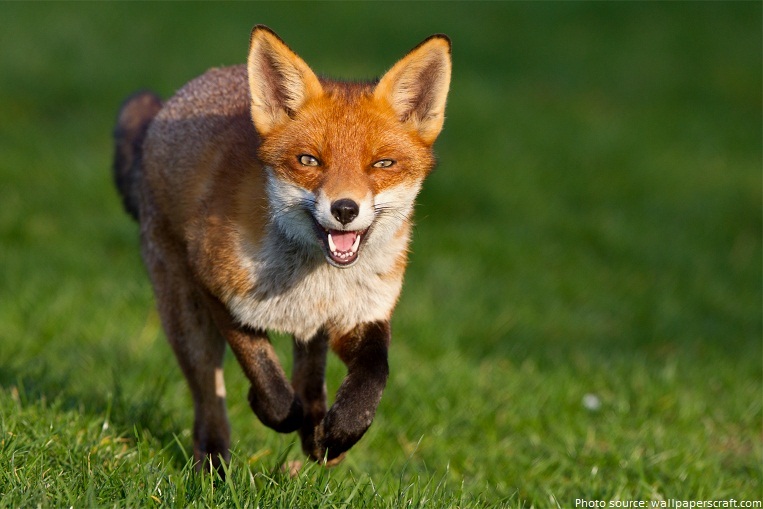 Many animals use the magnetic field to sense direction birds, sharks, and turtles but foxes seem to use the Earth’s magnetic field to track down their prey, apparently the only animal to use the field to judge distance as well as direction. A pair of researchers in the U.S. and Germany believe foxes have an innate augmented reality system allowing them to accomplish this. Foxes have excellent hearing. 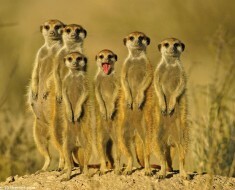 They can hear low-frequency sounds and rodents digging underground. 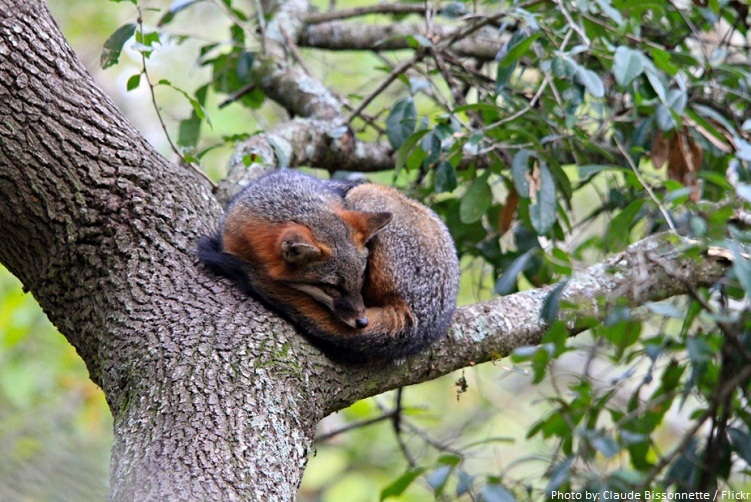 Grey foxes who live in North America are the only member of dog family who can climb trees! Foxes have beautiful fur, and as a result, the heartless fur industry both breeds captive foxes and traps foxes in the wild.